The Potter was established in 1981. Over the years it has grown into a full production studio and shop with kilns firing around the clock. 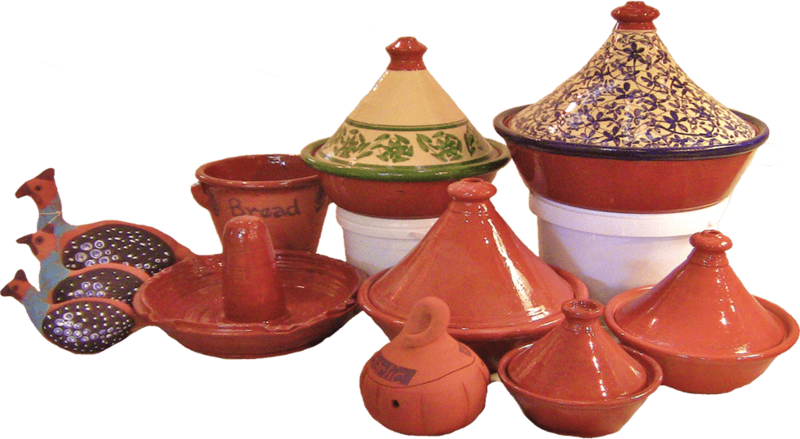 The ware produced ranges from a wide variety of functional ceramics to decorative ware, handmade washbasins and exotic Moroccan pots. Individual and unusual orders are also accepted and part of production is exclusive to interior decorators and various shops. This exciting studio shop has a distinct Mediterranean flavour and also sells olives, olive paste and olive oil together with olive serving dishes and amazing olive spoons. It is certainly a delight to visit this creative hive, always adding new items to their quality ware. This is a working studio where the visitor can view the decorating and making of the clayware. The Potter is a rural studio shop which showcases the work of Rudi Botha, an artist who has been shaping clay and fashioning it into an eclectic range of ceramics for more than 35 years. After completing his studies at the old Johannesburg Art School, Rudi worked as an apprentice in Gordons Bay with Brain Haden before moving to the Garden Route. His first studio space was located at the old Keurbooms Post Office before relocating to his N2 studio. An ardent world traveller, Rudi’s work reflects the various influences in style gleaned from the diverse countries he has visited, but it was the Mediterranean ceramic techniques which had the most profound impact on him almost 25 years ago. He found the Mediterranean style fresh, vividly coloured and a liberating departure from the earthier-toned, wood-fired style which he studied at art school. Certainly his shop echoes a distinctly Mediterranean flavour, with items such as olive spoons and olive serving dishes and olive products grown and produced in the Karoo on sale. Rudi has also been significantly influenced by the functional ceramic ware from countries such as Morocco and Tunisia and has produced a beautiful range of exotic ceramic lampshades, tagine pots and washbasins. There is a ‘little something’ in Rudi’s studio shop collection for everyone and The Potter is a must for those exploring the richness of the N2. The Potter also has a Holiday Unit to rent in Plettenberg bay. This unit is in walking distance from the Beacon Isle Hotel and Main Beach and close to a supermarket and shopping centre. For more information about renting the unit, please contact Paula Crawfort-Brunt on 072 232 4427. There are some pictures on our product page of the unit’s location.